If you are a Fab Four fan and an aspiring guitar player, then you’ll enjoy in our list of easiest Beatles songs to play on guitar. The argument as old as time. Who is better: the Beatles or the Rolling Stones? These two bands are not only among the greatest music acts in the history but also 2 bands that became synonyms for rock music (and The King of course). I am a bit stretched on this topic. While I like songs from The Beatles more, the overall feel of dirtier, extravagant and electric of the The Rolling Stones also appeals to me. If you want to crunch it into numbers, then there is no doubt. 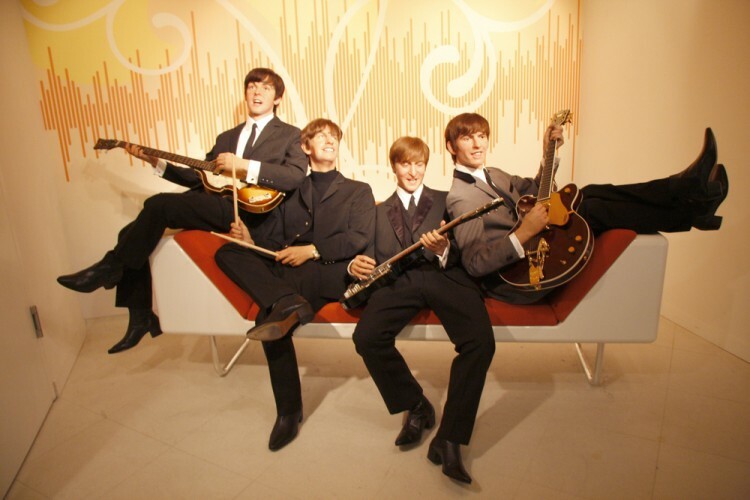 The Beatles are the biggest music act in the history. They sold close to 300 million records (verified) while the actual sales might have been closer to 600 million. Then you have multiple chart records and what not. And all of that in 10 years. Of course, you know the story. The band is successful, has millions of fans – there comes a woman – band splits up. I think lots of people share my opinion that Yoko Ono is to blame for why The Beatles split up. Get this. Although all band members agreed that there are no wives or girlfriends in the studio, Lennon would bring Ono to White Album studio sessions and argued she should give her artistic input to the album. This, of course, didn’t sit well with the rest of the band, and Lennon became distant. Yes, I know lots of other factors contributed to the breakup, but let’s all agree Yoko is one to blame. Although, in the end, it was maybe for the best. This way we saw that the members of the Beatles were great musicians also as individuals. Let’s talk about playing songs from the Beatles on guitar real quick. There is a distinctive difference between the songs from the band’s early career and the ones that they played later. The earlier songs are without any doubt easier to play. The guys didn’t complicate much at first. The rock music was in its early beginnings, so it was important to keep it simple. Later, they used more complex techniques and experimented with different sounds, making the songs harder to play for others. I think this is something most bands tend to do. When they struck gold and become famous, then they get bored and look to challenge themselves and their fans. Also keep in mind that The Beatles used to record multiple versions of one song, sometimes making them sound completely different, so always stick to the album versions. Since you are already here, I guess you like classic rock. If that’s true, then check out our list of Easiest Classic Rock Songs to Play on guitar. When it comes to creating the list of easiest Beatles songs to play on guitar, I’ve relied on multiple websites like Beginner Guitar Lessons and Gibson including few YouTube tutorial videos while also reading forum topics on Reddit, DM Beatles, and Beatle Links. I looked for the songs that were recommended the most by other guitar players as the easiest to play from The Beatles. Since I also play guitar for a long time, I know the opinions can be subjective when it comes to the complexity of playing a particular song. So, I’ll immediately admit I have been a bit subjective, since there were few songs that had the same amount of recommendations, and I’ve moved up the ones I thought were easier. If you disagree with some of the entries on the list, please share your thoughts with us in the comment section. Let’s now check out the list.